"Saturday, what a day" - as the theme tune to Happy Days used to tell us. For me, it was one of the best Saturdays for a long time despite having to get up at 3.45am for work! However, the good thing about that was that it got me out in time to actually watch a live game but more on that later. As a QPR fan, one of the main events of the season is the derby with west London rivals Fulham. Yesterday we came up against them in a lunchtime game (meaning I couldn't go), with many Rangers fans expecting the worst. Not only have the Cottagers completely dominated us in recent years with several wins by four goals or more, we were heading into the game on the back of yet another unwelcome scandal, still to be proven, this time surrounding our manager Jimmy Floyd Hasselbaink. The Dutchman's name has been dragged through the mud this week after corruption allegations were made about him in the Daily Telegraph (all vigorously denied by JFH). With recent results having also been iffy, many QPR fans had their knives sharpened and were ready and happy to give him the boot, especially if Fulham got one over on us again. What transpired was quite remarkable. The hosts were awarded but then missed an early penalty. QPR took the lead through a striker who hasn't been able to score for toffee since signing in January. Fulham equalised through an even more ineffectual frontman before Rangers weathered some heavy pressure and then nicked a late goal to lead 2-1. But the drama didn't end there as the Cottagers won and then missed another penalty with the final kick of the game. Cue scenes of wild celebration in the away end! While all this was going on, I was making my way out to the suburbs of north-west London where I grew up to go and watch Harrow Borough, my other football love, host Winchester City in the third qualifying round of the FA Cup. Things start to get serious at this stage of the competition with clubs well aware that only 180 minutes of football separate them from the First Round Proper and ties against the likes of former Premier League clubs like Bolton Wanderers, Charlton Athletic and Sheffield United. With £7,500 up for grabs just for winning Saturday's tie, the money on offer in the FA Cup is huge to sides who play further down the pyramid. On paper Harrow were the stronger team, playing a level above their opponents who had made a not inconsiderable journey up from Hampshire. However, it was the visitors who took an early lead from the penalty spot and then went on to have much the better of the first half to lead 1-0 at the interval. Whether the conditions or the slope on Harrow's pitch played a part I don't know but the second half was almost one-way traffic with Boro pushing for an equaliser. Despite seeming to have most of the play, they didn't really create any great chances until the closing stages when Shaun Preddie equalised from a corner and then Ibrahim Meite won it deep into injury time with a composed finish from a cross. When I used to watch Harrow regularly, they were always woeful in the FA Cup but they've done pretty well over recent years reaching the First Round in 2010 (losing to Chesterfield) and the Fourth Qualifying Round again two years ago. With all the National League sides entering at the next stage, there are going to be some big names waiting to be picked in Monday's draw. With the competition still regionalised at this point, Harrow won't be able to draw Tranmere Rovers but former Football League clubs like Dagenham & Redbridge, Aldershot, Maidstone and Torquay are all a possibility as is a derby against local arch rivals Wealdstone which would be quite something! Well that was my Saturday - I hope yours was good too. Next weekend I'm intending to go to Dulwich Hamlet v Bognor Regis Town. There's another international break and the hosts are offering a special deal to get new people in. 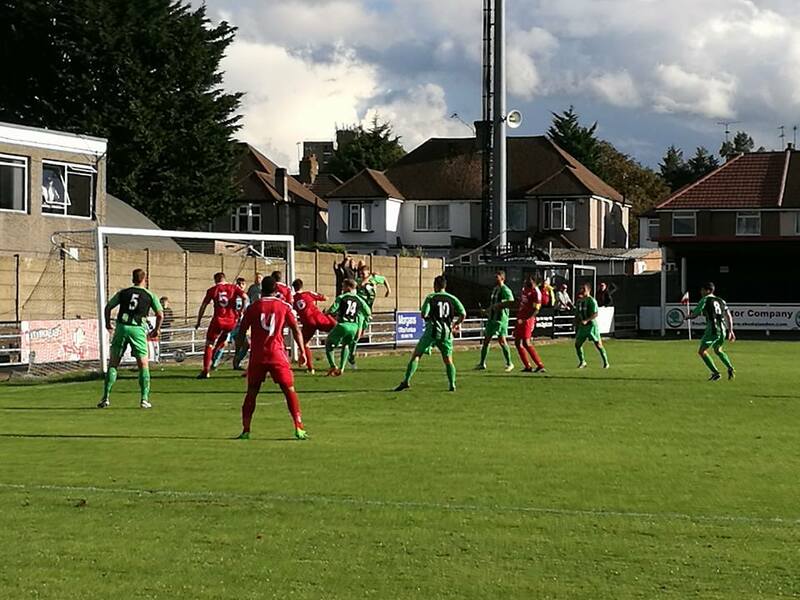 Harrow Borough have also got something planned too - see the Daily Digest towards the foot of the page for the details. Talking of Dulwich, our friends at 'Two Men In Search Of The Beautiful Game' recently went to check out their game against Hendon - you can read about it here. Despite there being an international break there are still 90 matches in the London area over the next week with a World Cup qualifier and games in the EFL, FA Cup, FA Trophy and several county and minor league cups. Checkatrade Trophy - this competition features League One, League Two and, controversially, U23 sides from 16 Premier League and Championship clubs. We're still at the group stage at the moment and tickets are very cheap with adult tickets at between £5-10 for most games. 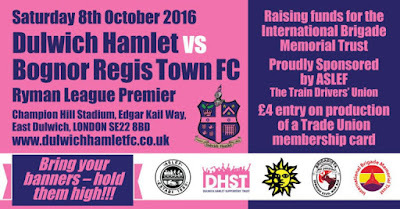 Dulwich Hamlet v Bognor Regis Town @3pm - these sides last met in last season's play-off semi-finals which Dulwich won. So far this season, Bognor have made the brighter start but it should be close. A big crowd is expected, especially as the hosts are holding a 'Trade Union Day' so if you're a member of a union and turn up with your membership card you'll get in for just £4. Harrow Borough v Billericay Town @1pm - the other deal of the day is to be found at Earlsmead where kick-off has been brought forward to allow anyone with a ticket for England v Malta to pop down there first (it's a five-minute train ride from Wembley) and get in for £5. FA Trophy Preliminary Round - this knock-out cup competition, with its final at Wembley in May, is contested by teams in the fifth to eighth tiers. This is the opening round and features sides from the eighth tier only.